PS Krishnan, former secretary to Government of India, Ministry of Welfare, in a letter to Prime Minister Narendra Modi, has argued that there is an urgent need for Constitutional amendments following the Supreme Court judgment on September 26, 2018, which said that the reservation of Dalits and Adivasis in job promotions is not compulsory. The letter, distributed through Dalit Media Watch, cites media reports to say that the government appears reluctant to go ahead with the amendments. From my more than seven decades of country-wide experience, I have spelt out the issues and the obstacles that stand in the way of fulfilling the goal of securing Equality and Justice for SCs and STs in the machinery of administration and governance and the Constitution Amendments required to smoothly and quickly achieve that goal. As always I have formulated my suggestions from the perspective of social integration and optimal national progress, for which Equality for SCs, STs and Socially and Educationally Backward Classes (SEdBCs) with the Socially Advanced Castes (SAC) is a sine qua non. Newspaper reports indicate that the Government is hesitating to go forward on important measures like the present one on account of apprehensions about possible reaction of “upper” castes, following the agitation of some short-sighted powerful persons of the “upper” castes against the SC and ST (Prevention of Atrocities) Amendment Act 2018, justly and rightly enacted on the initiative of the Government led by you. I have already sent you on September 26, 2018, a copy of my letter to the Chief Minister, Madhya Pradesh, and a comprehensive note I have prepared on that ongoing agitation. I would suggest for your kind consideration that the country’s interests will be best served if decisions are taken without hesitation based on what is fair, what is just and what the Constitution mandates. Keeping that in view, I request you to kindly consider giving your nod to the Minister for Social Justice and Empowerment (SJ&E), Minister for Law, Minister of State for Personnel etc. to take prompt action to process and move Parliament for enacting, in the ensuing Winter session 2018, Constitution Amendments suggested by me in the enclosed letter to Minister for SJ&E. Considering that the SCs and STs are very poorly represented at higher and promotional posts, there is absolutely no justification for anyone to resent measures like the suggested Amendments, to ensure that they reach their population-equivalent proportion at all levels of administration and governance. to remove the recent Executive Order by which reservation in promotion was limited to the first level of Group-A. I have been urging the Minister of Personnel in this regard from time to time. Kindly consider issuing Executive Orders in respect of these three items now. These three measures and Constitution Amendments suggested will be fair and give satisfaction to SCs and STs – one of the Amendments also to the SEdBCs. It has always been the practice to fix reservation for SCs and STs as a percentage equal to the percentage of their population in the total population of the country in respect of reservation in the Centre and, in the case of States, as a percentage equal to the percentage of their population in the respective States, as per the latest Census. The present 15% and 7.5% reservation for SCs and STs were fixed on the basis of the 1971 Census and 1981 Census and certain developments in between. Though the percentage of the population of SCs and STs has increased since then as per the Censuses of 1991, 2001 and 2011, the consequential increases in reservation for SCs and STs were not possible with the introduction of 27% reservation for Socially and Educationally Backward Classes (SEdBCs) and the Supreme Court’s observation that the Constitutional provisions require a maximum limit of 50% for reservations for the three social classes. 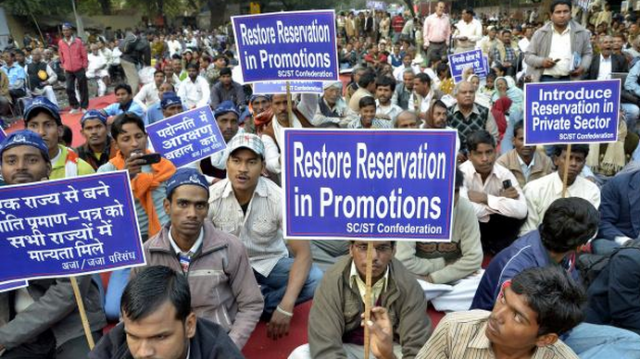 Reservation in promotion has been in vogue only for SCs and STs in the services under the Centre since the beginning in 1955 and as confirmed by new Clause (4A) of Article 16. Hence the reservation percentage for SCs and STs in promotion in the services under the Centre can, without any hesitation, be increased to their population-proportion level, at present 16.6% and 8.6% respectively, since such increase will not result in exceeding the 50% limit. This can be laid down straightaway by an Executive Order. State Governments may also be advised to raise the reservation percentage for SCs and STs in promotion in the services of the respective States to the level equivalent to their population in the population of the respective States. The Ministry of Personnel issued certain Orders on reservation in 1997. These contained certain good aspects as well as one negative aspect. The negative aspect was that a new 200-point Roster was introduced in the place of the 200-point Roster that existed prior to that. In the previous 200-point Roster, the SCs had the 1st point of Roster, the STs the 3rd point and the SEdBCs 5th point. The 2nd, 4th and 6th points were for the “General”. All the 200 points in the Roster were covered in the same order. But, the Roster introduced in 1997 relegated the SCs to the 7th point, the STs to the 14th point and thereafter in the same order. This meant that 6 vacancies had to be filled including the 5 for the “General” before an SC could get a post. Similarly, 13 posts had to be filled up, mostly by “General” candidates, before an ST could get a post. This has done great harm to the SCs and STs. This new Roster was introduced by a misunderstanding or misinterpretation of the Sabbharwal judgment of 1995. The pre-1997 Roster was balanced and fair to SCs, ST and SEdBCs. It was also fair to the General since every alternate post was for the General and most of the posts to General go to those who are not SCs, STs or SEdBCs, i.e., the unreserved category. Clause (4A) of Article 16 does not place any limit on the level to which reservation in promotion for SCs and STs will operate. But, the DoPT has limited it only up to the first level of Group-A by an Executive Order. This is a violation of the Order and practice that existed prior to the Constitution (Seventy-Seventh) Amendment Act inserting Clause (4A) in Article 16. There is no justification for this limitation. Unlike the earlier period, candidates from SCs and STs are now available for promotion beyond the first level of Group-A. If at all in any year for any higher level of promotion qualified candidates of SCs and STs are not available, the carry-forward rule can be utilized and in the meanwhile efforts made to see that requisite pool of qualified candidates is prepared at the lower level.